An uplifting shampoo suitable for all hair types and no longer just for men as women love it too! Faith in Natures Blue Cedar shampoo contains Swedish Mountain Herbs and Blue Cedar for a fresh herbal lift together with natural vitamin E, glycerine and organic green tea. 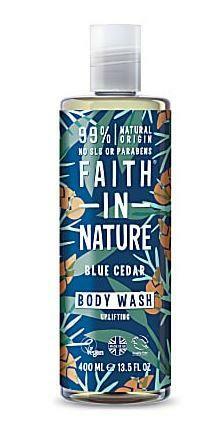 How to use Faith in Nature Blue Cedar Shampoo; Massage gently into wet hair, rinse well and repeat if required. In case of contact with eyes, rinse with clean water immediately. If irritation occus, stop use. Keep out of reach of children.